Anyone in Albion knows this smiling face! 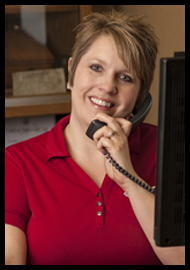 Meet Misty, “Professional Listener and Problem Solver” – a.k.a – Customer Service Supervisor. Misty has been with the company since 1991, during which time she has developed a long standing relationship with many of ATC’s customers. She loves working with, and genuinely cares about, every customer. When she’s not diligently assembling your monthly statements, you might find her munching on chocolate covered cinnamon bears 🙂 She is a dedicated mother and wife, and loves spending time with friends and family. We’re thankful to have Misty as a leader in our Customer Service department!